Nutties – 2 packets for the eggs on the cupcakes. Beat the butter and powdered sugar for the cupcakes till smooth. To this add the maida, cocoa powder and milk and with the help of a spatula fold in. Now add vanilla essence, baking powder and soda bicarbonate. Mix again. Now line the cupcake moulds with cupcake paper cups and the pour the batter into each cupcake mould only till half. Preheat oven and then bake the cupcakes at 180°C for 20 minutes. Once the cupcakes are baked allow it to cool. Now, prepare the icing by beating the softened butter with icing sugar till smooth. To this add the green colour and vanilla essence. 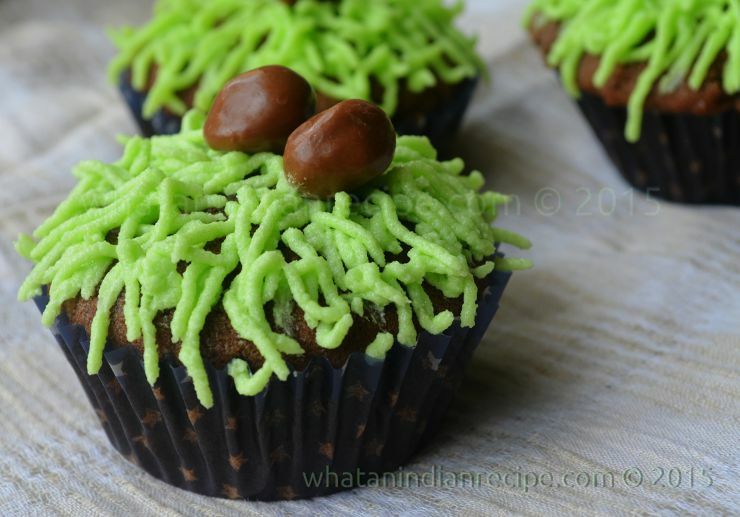 Beat again finally add milk and mix well.. Pour the prepared icing into piping bag and attach the grass nozzle and squeeze the icing slowly on top of the cupcakes to cover it with grasses and then finally keep two Nutties in the center as eggs to give a nest like look. As I didn’t have grass nozzle so I used the nozzle with 1 single hole and then made many single lines to give it a nest like look. Your Easter cupcakes are ready. Happy Easter.